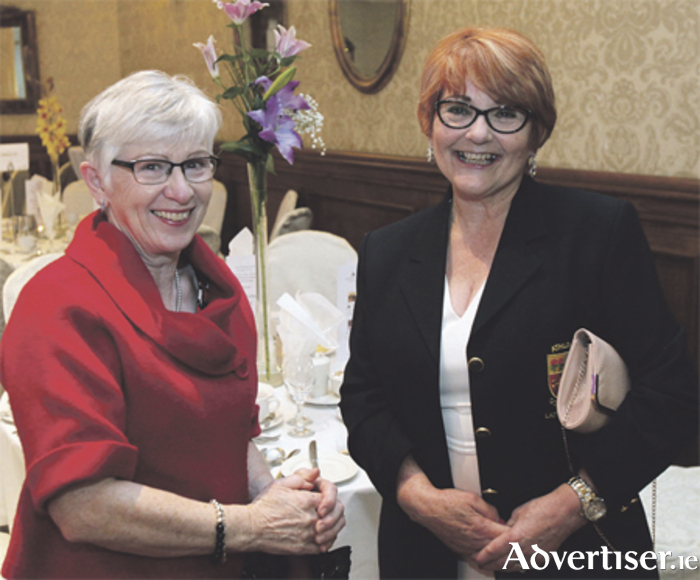 More than 220 members and friends of Athlone Golf Club gathered in the Hodson Bay Hotel recently to celebrate the club’s 125th year in existence with a gala lunch. The splendid facilities of the hotel were put at the club’s disposal. The link between The Bay, as its affectionately called locally, and the club was appropriate as the Hodson Bay Group are also this year celebrating their 25th year in business. The generous sponsorship by the hotel of this event was mentioned in a speech by the vice captain of Athlone Golf Club, Padraig O’Connor. Ladies captain, Noirin O’Rourke, whose family connections have a long and illustrious connection with Athlone Golf Club, formally welcomed everyone to this special event and outlined the programme of events for the year ahead. The after-meal formalities were brought to a fitting end by the president of the club, Lily Hynes, who urged members to continue to strengthen the ideals of community and friendship which are so much the hallmark of the club. It was well into the evening before the memories of shots played and matches won or lost were put away for another day.